We have 2 main interests in life: the outdoors and great food. Saguaro National Park is conveniently located just outside of Tucson, so we got to check out a sampling of its restaurants on our trip. 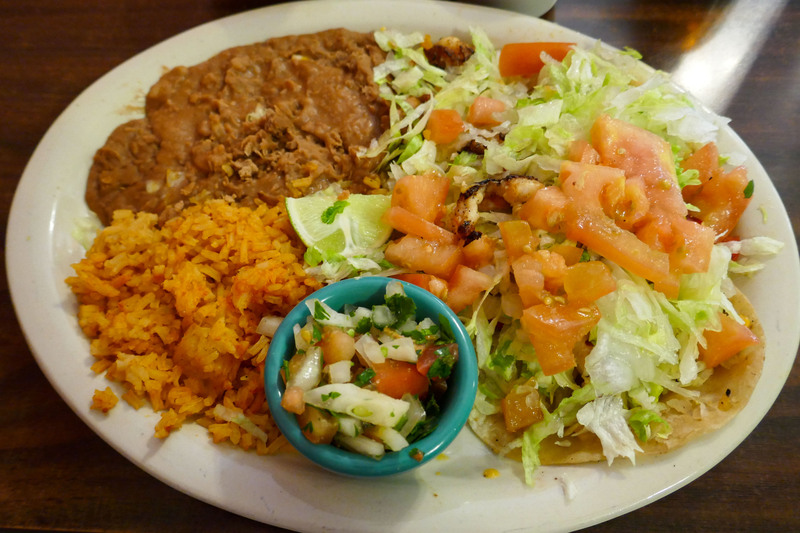 Tex-Mex cuisine is seriously lacking in DC, so we were excited to try some in the southwest. Tucson Tamale is a local institution that I had read about before our trip. We visited during the week and at an off-time, so we had the place mostly to ourselves. I ordered two tamales: the red chile beef and the vegan blue corn & veggie. T got verde pork & cheese and spicy chorizo beef tamales. The employee who took our order was friendly, and the food came out fast. At the small topping bar, I grabbed some pico de gallo, which I mixed with my rice and beans, elevating the flavor. Then we got to unwrapping our tamales. All the tamales were moist, and the red chili beef was the biggest hit flavor-wise. It had some green olives (I think) which complemented the pork and chili. Even T liked it, and he’s not a fan of olives. We would have gone back if our trip had been longer than a week. 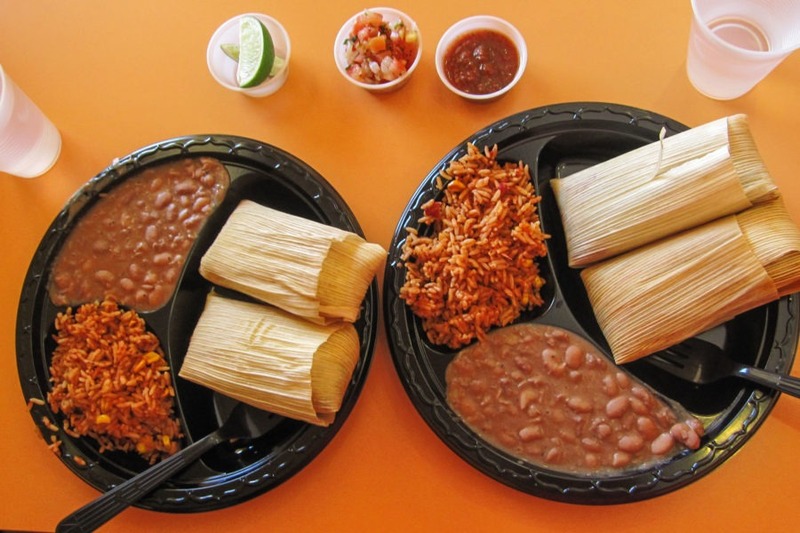 Apparently you can place online orders for frozen tamales, which we definitely plan to do! In researching Tucson’s food scene, we came across a relatively recent regional creation: the Sonoran hotdog. It’s a hot dog wrapped in bacon, with beans, salsa, mustard, mayo, and other southwest-style toppings, inside a crispy boat-like bun. This was at the top of my list, and we had two during our trip. The first was at el Guero Canelo, a fast casual type chain. We stopped there after a 3-day backpacking trip to Manning Camp when we were deliriously hungry after descending 4000 feet over about 10 miles in a day. Since we hadn’t showered in three days, we decided to take our food to go (for the benefit of other guests). We each ordered a Sonoran hotdog, and added marinated onions (which were just okay), lime, and salsa from the topping bar. The flavors did not disappoint, but the bun wasn’t crispy by the time we got our food back to the hotel. I assume that’s because we got takeout, and would recommend eating it at the restaurant. Also, since we had just returned from a 3-day trek, I wished I had ordered two. 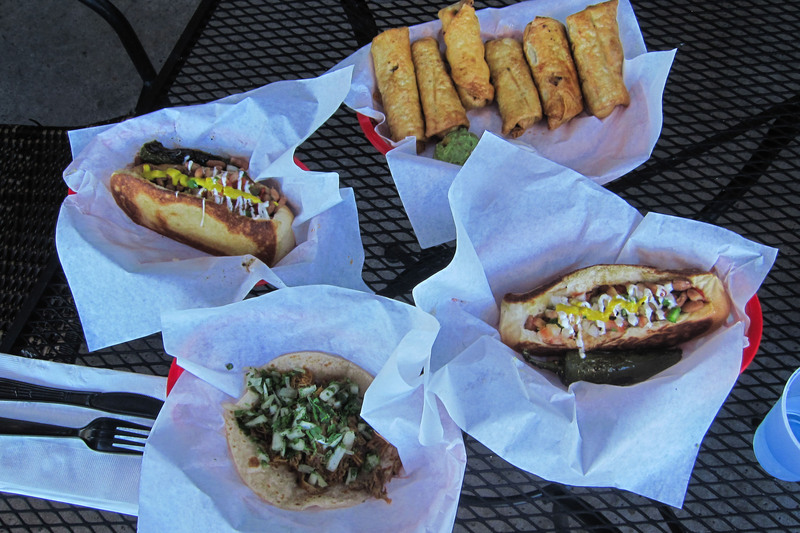 We later grabbed a second Sonoran hotdog (and other goodies) at Calle Tepa. 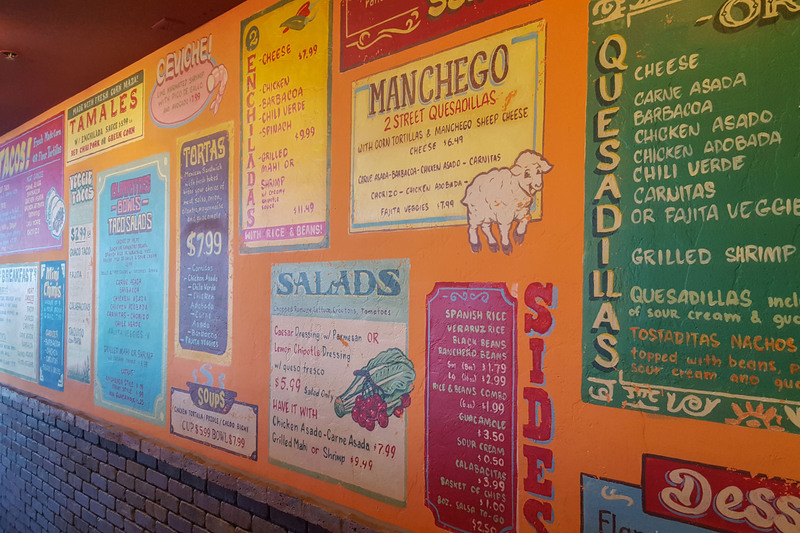 We walked past their huge, colorful menu painted on the wall, and ordered at the counter. They have a large selection, so it was difficult to choose. The staff was friendly, and our total came to about $20. After ordering, we went to grab a seat. Since it was pretty frigid inside, we chose to eat on the patio, which, thankfully, was shaded. Service was super fast. I got a carnitas taco, which tasted good, but wasn’t anything special (tacos are one thing we do have back home. If you’re in Northern VA or DC, I suggest a trip to Taco Bamba). We each got a Sonoran hotdog, which had an amazingly crispy bun. The toppings were tasty, and it was slightly spicier than el Guero Canelo’s. It’s tough to compare the two Sonoran hotdogs we had on our trip; I would happily check out both places again. T also got an order of mini chimichangas, which came with guacamole and sour cream. T’s take: they were very crispy, but he wished they had more of a sauce and maybe some cheese on top. Also, it was too much for him to finish with all the other food we had ordered, so he took the leftovers to go. 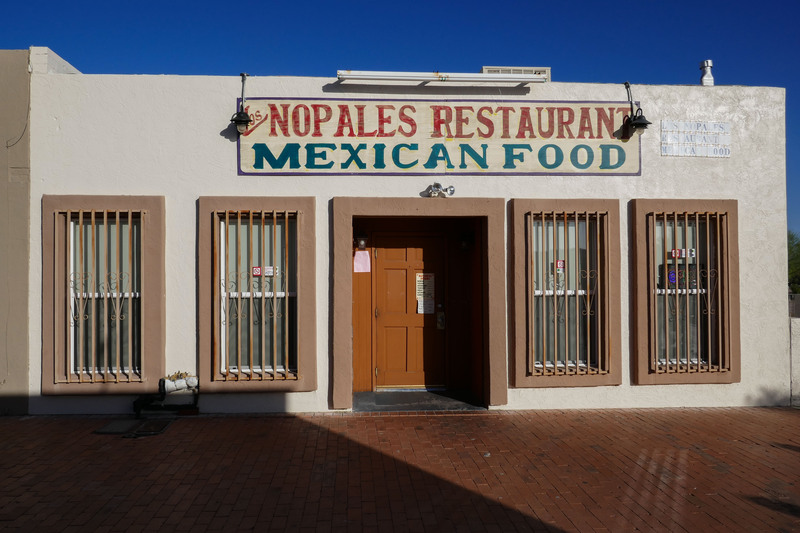 We also went to a Mexican place called Los Nopales, which is a short drive from Saguaro’s Tuscon Mountain (west) District. It has great reviews on Yelp (4.5 stars) and the space has a no-frills vibe which I definitely appreciate. There were complimentary chips and salsa, which I enjoyed and ate plenty of. I ordered shrimp tacos and T got the chimichanga. It was a large plate of food, and we agree it tasted decent, but there was nothing special about it. I might revisit, but I wouldn’t go out of my way to do it. 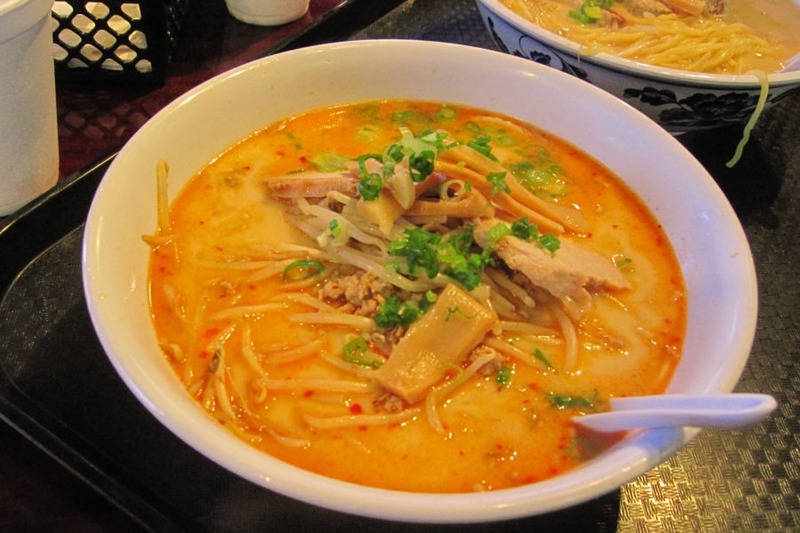 Ramen may not be what Tucson is known for, but since we love it, we decided to look for a local Ramen joint. Ikkyu is a relatively highly rated, mostly takeout place. We arrived with the lunchtime crowd, but a random guy was nice enough to share his table with us. The tonkotsu (pork bone) broth was the star of the show with its deep umami, almost buttery, flavor. They made mine not spicy at my request. The noodles were thick, which we prefer, and they had a decent bite. The pork on top was flavorful, but dry. T liked the ground pork that was added. It had a few slices of bamboo shoots, scallions, a small portion of bean sprouts, and a fish cake. The toppings tasted decent, but we wanted more of them – and maybe a marinated egg. Note: ramen is only available Thursday through Saturday. After hiking in the Rincon Mountain District one day, we needed to refuel. 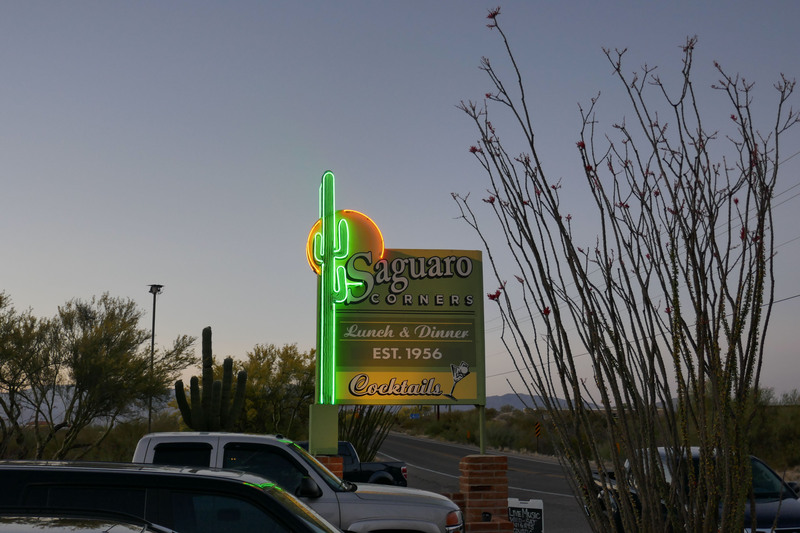 We had passed on a place called Saguaro Corners a few times already, thinking it looked kitch and noticing the Yelp rating was only so-so. But we were curious, and decided to stop in for dinner since it’s located right outside the park boundary. The place was packed, much larger than we thought, and a musician was playing in their outdoor seating area. After a short wait, which gave T an opportunity to check out the beer list on the chalkboard, a table opened up inside. We followed the hostess back to our table, which was next to an small (man-made) outdoor waterfall. 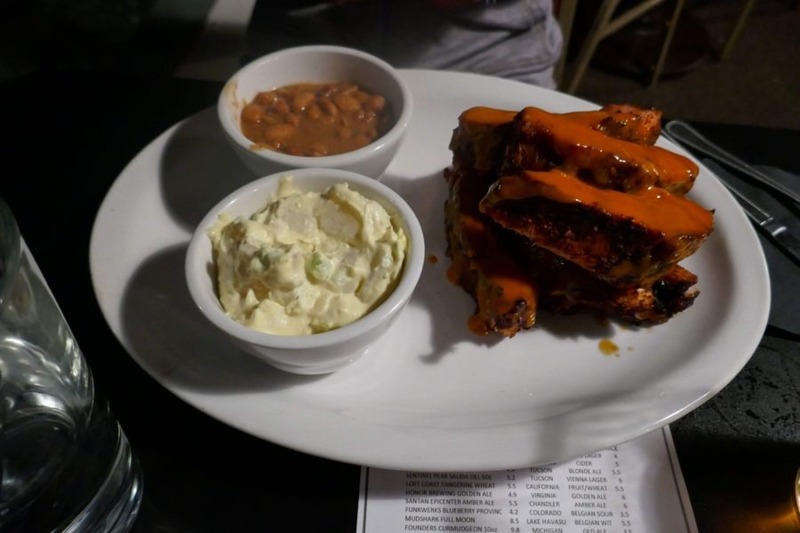 I ordered the ribs with fries and potato salad. The meal was good, and the potato salad in particular was delicious. I also tried the Cider Boys Strawberry Magic cider which was probably the best cider I’ve had in life. Sweet and fruity, which I like. Too bad they don’t have it back home. 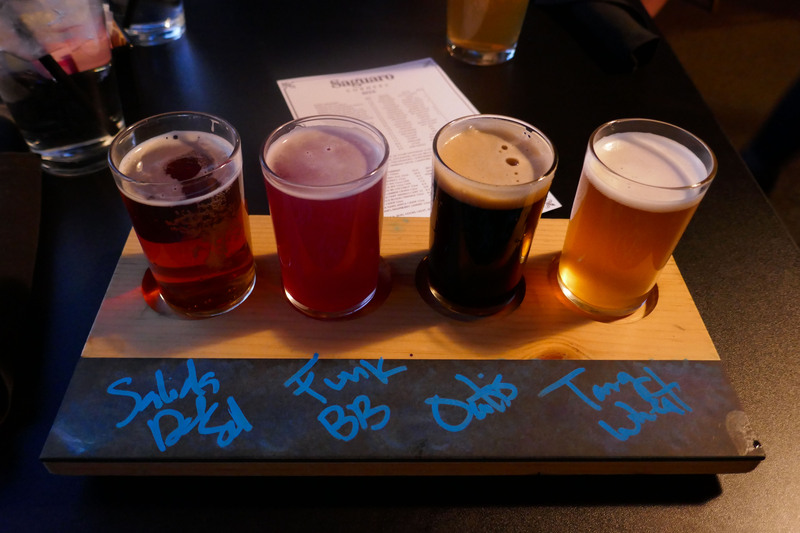 T got a flight, of which he enjoyed most of his selections. While not in Tucson, Farm House Bakery Restaurant was the only place open on Easter Sunday in a town called Benson, AZ. It was the eve of a 3-day backpacking trip to Manning Camp. I recommend their home-cooked food, quirky decor, and old-school country tunes. I ordered the pulled pork sandwich with barley vegetable soup, and T got the avocado bacon burger. The food was basic, but filling with a home-style quality. 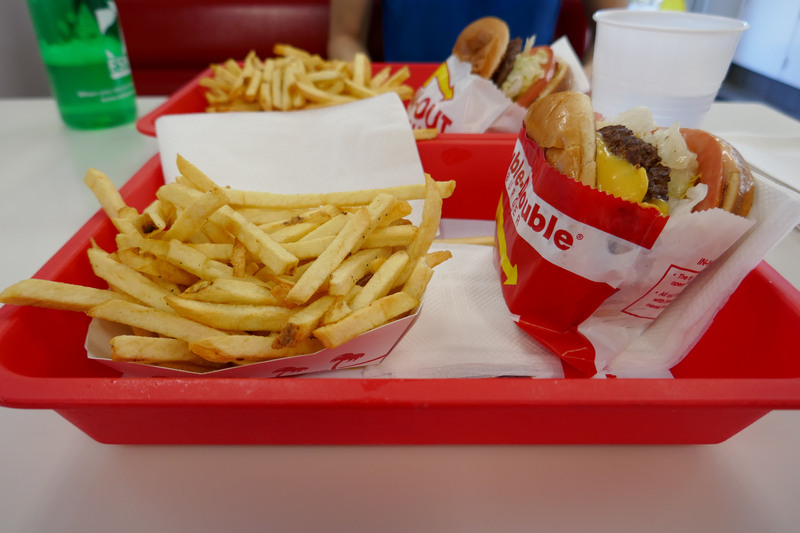 If you need a quick burger fix, check out In-N-Out Burger. We have Five Guys on the east coast, but I had never been to In-N-Out. Even though it’s fast food, I recommend a visit for the solid burgers and fries. Since I’m sensitive to dairy, T always searches for places to get dairy-free “ice cream” when we travel. He’s pretty awesome like that. This time, he found a shop called Cashew Cow, a name I thought was punny and cute. We stopped by, and each ordered a cup of ice cream. I got chocolate chip cookie dough, and T thinks he got something with cinnamon. It was tasty, but didn’t “wow” us. 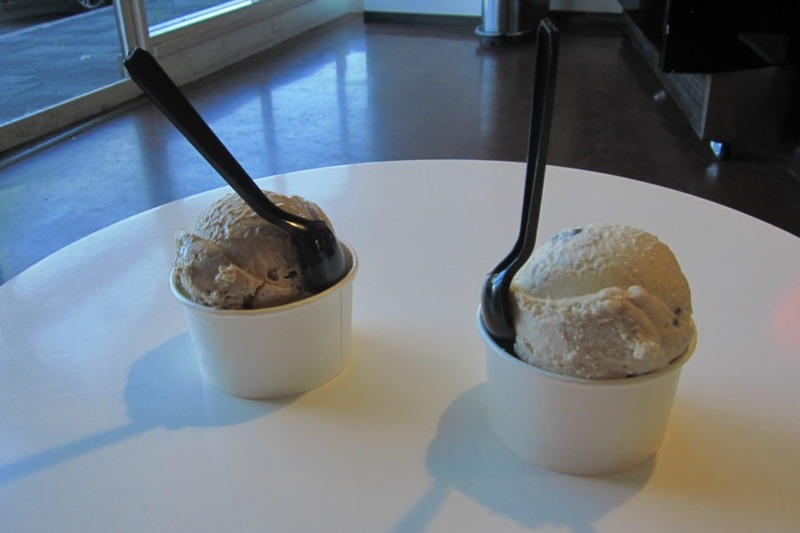 The portions were small, and it was pricey (about $14 for two ice cream cups). Also, not sure why they cram the ice cream into those tiny cups which makes it hard to eat. But gotta love that there’s a non-dairy option! 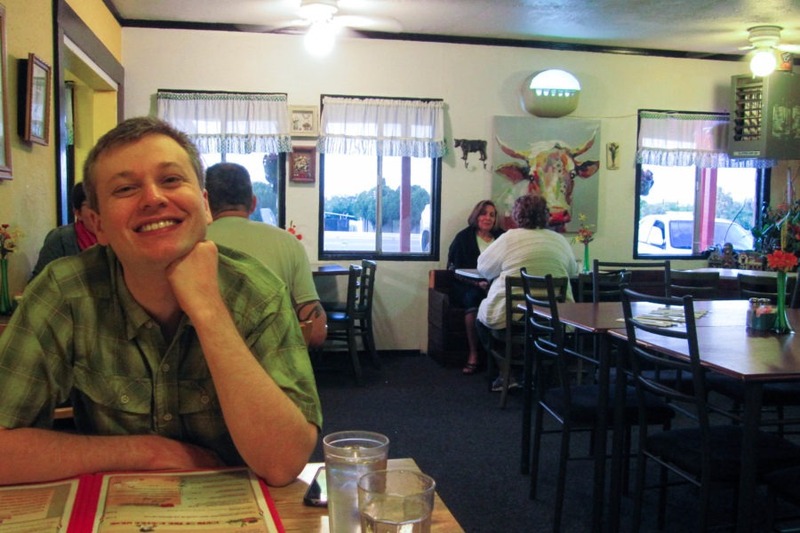 It was so rewarding trying out some of the dining options Tuscon has to offer. 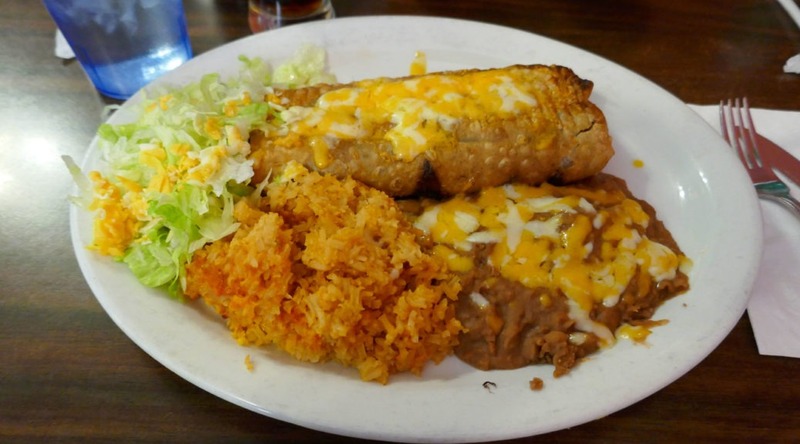 Let us know if you’ve scoped out any good eats around Tucson. What did we miss?